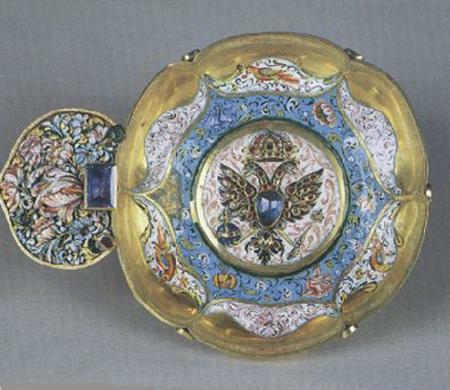 Belonged to Grand Prince Vasili III. Silver, mother-of-pearl, embossing, engraving, gilding. 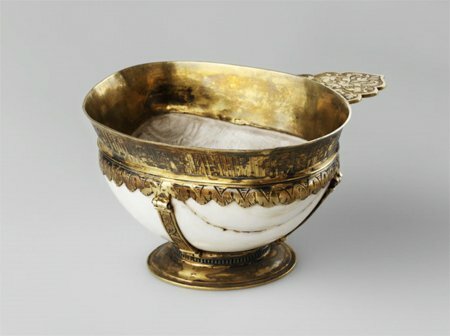 Belonged to Tsar Vasily Shuisky. Russia, Moscow, the XVIIth century. Gold, precious stones, cornelian, embossing, engraving, granulating. Belonged to Tsar Mikhail Fyodorovich. Russia, Moscow, the Moscow Kremlin Museums, 1609-1650. Gold, precious stones, embossing, enamel, engraving. Gold, precious stones, rock crystal. 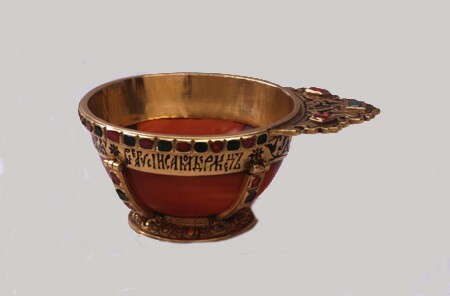 Granted to Tsarevich Ivan by his mother, Tsarina Eudokia Lukianovna, the second wife of Mikhail I Fyodorovich. Russia, Moscow, the last quarter of the XVIIth century. 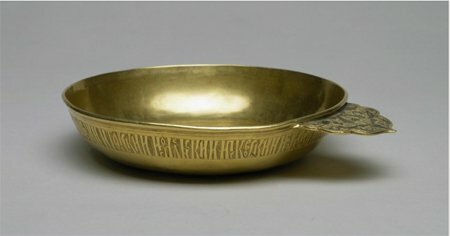 Quaich - charka - is a round drinking vessel, forms of which are representative of traditional tableware of Old Rus. 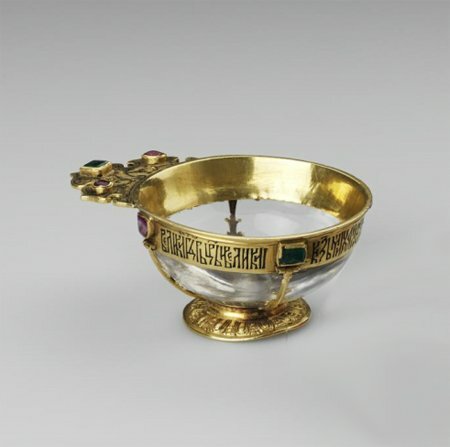 Quaiches were used for serving a special strong drink called "Tsar's wine". 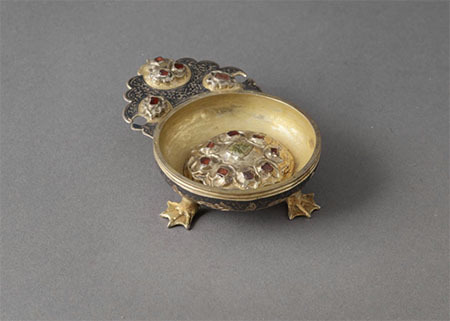 Having been executed of precious metals, rare wood, semiprecious stones, they were decorated with chased foliate design or images of birds and pelagians. 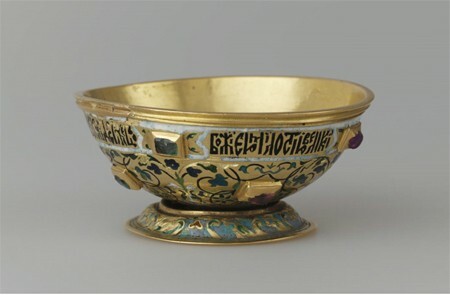 Delicate ornamental decoration of the charka also included inscription with a name of the owner. The Armoury collection contains several examples of such a Russian national vessel. One of them is made of rock crystal and bears an inscription on a dark blue enamel ground showing that it was the property of Tsar Mikhail Fyodorovich. Delicacy of the translucent stone and its striking beauty are brought out by a lavish gold surround. Its handle is finished with brilliant green and white enamel and decorated with sparkling precious stones - emeralds and tourmalines.